We offer creative, unique social media consulting and packages for businesses nationwide. 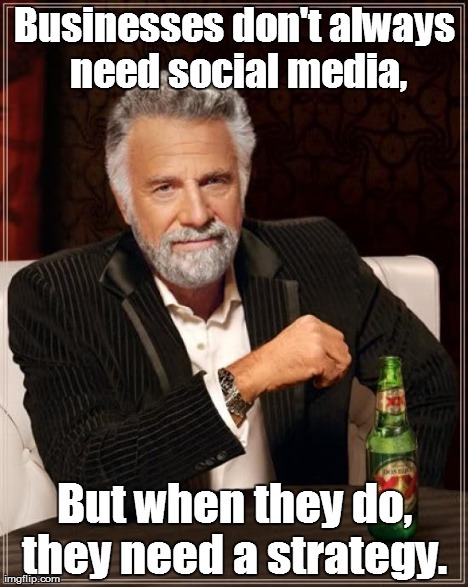 A prerequisite to social media is almost always content. If you do not have great, unique content going up onto your website on a regular basis, it will greatly benefit you to stop reading and go to content marketing. Creating content is where we shine. Below you will find out what exactly our expertise in social media and social media marketing is, and what it is not. We have spent a tremendous amount of time researching social media and we hope that you will find our perspective on it unique. There are plenty of aspects to social media that we are not fit to handle. There are areas of social where we have a deep level of understanding. There are businesses that can greatly benefit from social media. There are plenty of businesses that may not benefit from social media. In 1993 our founder, Len, built one of the largest and most engaging BBS systems in central New York. He also developed a network similar to FidoNet which distributed files nationwide. He was one of the first providers of UseNet and Internet email. While he is not extremely active on social media, he has explored every aspect of every network to date. If a new social app comes out and it is only for college students, he hires one. Insatiable curiosity or unhealthy infatuation? Perhaps a bit of both over the years. Researching and testing human-computer interaction for him has been a lifelong hobby. When the Internet took off, he explored every aspect from the ground up and worked with everything from burying fiber underground to working with corporate intranets. He has tried and failed with social media, and also found success several times. There are a plethora of people in the social media world. You can speak to a dozen experts and get a dozen different answers. Hopefully the above sheds some light on the unique perspective which we offer. If you are looking for our thoughts on what 13yr olds love on Instagram, how a vehicle manufacturer can get attention on Twitter, how Google+ could drastically improve their network, which brands get Facebook engagement, how is Yik Yak affecting your attendance to your college, should your school geofence a social app, are 8yr olds safe on Kuddle, should you avoid social media, how can law enforcement prevent anonymous threats online, how can beer be marketed, how can someone grow a large and engaged following, what is Yelp elite, can my law firm get business from Pinterest, or have other questions like this, we may be able to assist. We offer evaluation, coaching, consulting, and strategy. If you have in house staff to run your social media accounts, you may be a perfect match for us. Moving into 2015 we are no longer offering much management. If you have staff, we will be happy to offer them consulting (see above). If you just want your content plopped onto your social network of choice for a little SEO value, we can assist with this. 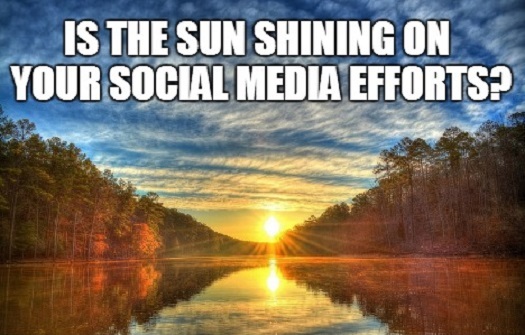 We have failed at, and found success with, paid social media several times. We also run Facebook accounts with a very engaged audience and can get amazing reach for $5. There are a LOT of factors in paid social and promoted posts. We will be happy to go over these with you if desired. For most businesses, Social Media is not the new SEO, it isn’t the old SEO, and it definitely isn’t the current SEO. If you need SEO, please feel free to visit our SEO page, but we’ll warn you in advance that much of your SEO revolves around your content. In 2014 we had one client become so successful from SEO they had to double their staff. Some networks do produce “DoFollow” links and there is some value. It is very rare but social can replace SEO – we’ve seen this most recently with a hot dog shop in Chapel Hill and a nearby brewery. If you are simply after links and SEO value from social media platforms and not out to spam these networks feel free to contact us. If your business or the face of your business would like a curation strategy feel free to reach out to us. Sometimes people curate on their own site, via RebelMouse, on Twitter, Scoop.it, Google Plus, Pinterest, Facebook, or even flipboard. If you aren’t sure how this works or are struggling to discover the value of this please feel free to reach out to us. Do I need cool pictures on social media? Sometimes. We shoot HDR photos specifically for social media sharing. Here is an example blow. If you were to share this page, the image below would use all of the available real estate. To be blunt we are not gigantic fans of Facebook. If you’re established, reaching your audience can be done with money and creativity. If you’re just starting out, you have an expensive battle in front of you. It can be done, and we have strategies for Facebook. Anyone telling you that you can magically reach people for $5 on Facebook is ignorant. Their algorithm changes often and chances are if you just read about a Facebook strategy from 6 months ago the information is null. Is Google Plus a ghost town? We have a page dedicated to Google Plus it is so complex. Google Plus is actually a very good platform. Yes, it is lacking the active user base Facebook has and your grandma probably has no desire to learn another social media platform after just figuring Facebook out. Google Plus influences Google’s personalized search results, is woven into Google search, is loaded with features no other network has, and is not going away any time soon. It is always fun to watch things go viral on there, and it just has LOADS of features. Here is a partial list of our Googley Google Plus communities. Can my business use Pinterest? This completely depends on the business. Pinterest can affect SEO. Pinboards can rank in search. Pinterest drives a lot of traffic. Are you selling awesome T-shirts online? Yes, Pinterest can absolutely help. Do you own a hot dog stand? Pinterest might not be a place where you should invest lots of energy. We have personal injury attorneys with a Pinterest presence; you would be surprised how well many businesses can do on Pinterest. We <3 Pinterest! Maybe, maybe not. We’ve seen pizza effectively marketed on Twitter at 2AM, and brands jumping on trending hashtags at just the right moment and going viral. Twitter is a very neat platform, and, you can talk to Vanilla Ice on it. Maybe. Stop asking so many questions and give us a call today!